Synnex Thailand Public Company Limited is ranked as the top sales company of IT products in Thailand. 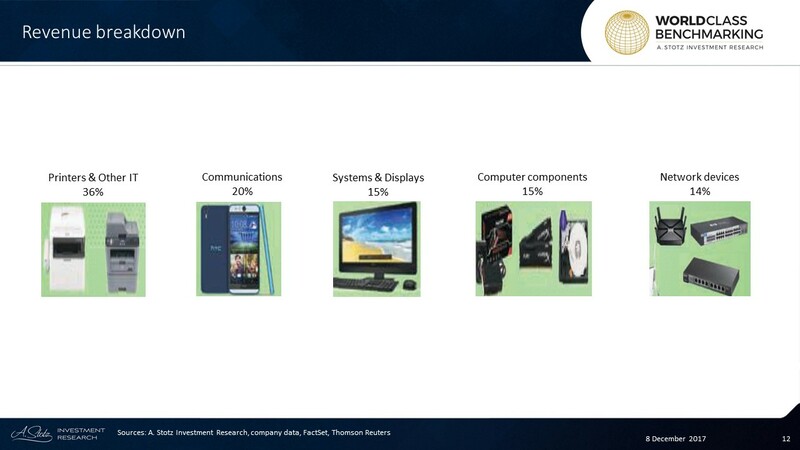 It engages in the distribution of computers, IT systems, and communication devices including tablet PCs, desktops, notebooks, and smartphones, as well as related components. It sells brands ranging from Apple and Dell to HP and Canon. SYNEX is an affiliate of Synnex Technology International Corporation (2347 TW), which is the largest IT distribution company in the Asia-Pacific region and the third largest globally. In Thailand, the company has the no. 1 spot in sales of IT products, ranging from computers to smartphones. The company sells all the major brands of computer, printer, and smartphone, including Dell, HP, Canon, Epson, Huawei, and soon Apple. The group sells to IT retailers and wholesalers, software solution providers, department stores, and other retailers. In 2016, computers and other IT systems and related computer components accounted for 30% of sales, while smartphones were around 20%. SYNEX has projected that this year these two divisions combined should rise to about 75% of revenue from 50%, supported by the recent authorized wholesaler contract signed with Apple. SYNEX also sells printers and related components and consumables, and network products such as routers and switches. 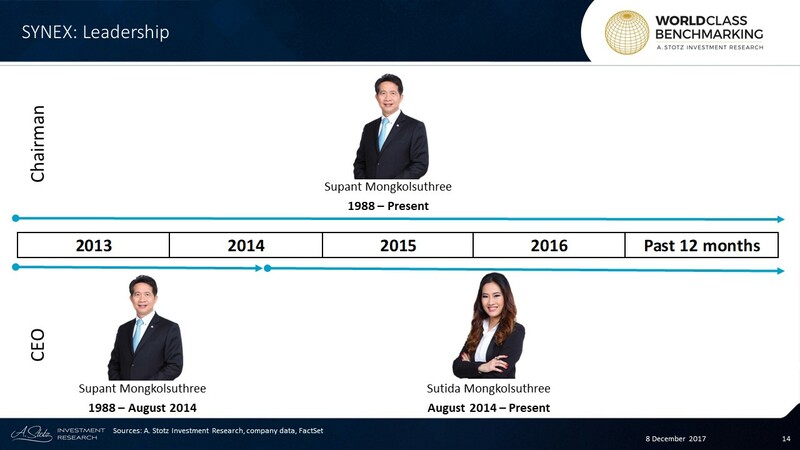 Supant Mongkolsuthree has held multiple positions at Synnex and other companies. Since 1988, he has served as Chairman, President, and CEO of Synnex. While he still holds his position as Chairman and President, he has passed on the position of CEO to Sutida Mongkolsuthree in 2014. Mr. Mongkolsuthree has obtained multiple qualifications including a Bachelors degree, two Masters degrees, and an honorary Doctorate from Ramkhamhaeng University, Thailand. Suthida Mongkolsuthree is the current CEO of Synnex. She has served as CFO and Vice President at Synnex for multiple years before taking on the role of CEO in 2014. She holds Bachelor of Administration in Finance and Banking from Chulalongkorn University and MS in International management from Queen Mary, University of London, UK. Profitable Growth has been stable at #5 since 2015. Synnex ranked in the average decile among 680 large Information Technology companies globally. 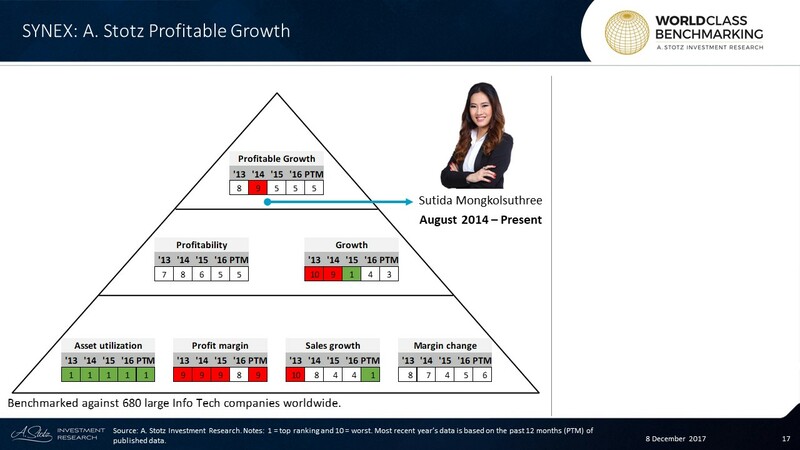 Profitability has been slowly improving but still ranked average. Growth rebounded in 2015 and has stayed above average since. Asset utilization has been consistently excellent at #1. However, low Profit margin has kept down Profitability. Sales growth have improved a lot and ranked in the top 10% in the past 12 months while Margin change experienced a small drop and ranked #6. Author: Dr. Andrew Stotz, CFADr. Andrew Stotz, CFA is the CEO of A. Stotz Investment Research, a company providing institutional investors with ready-to- invest portfolios in Asia that aim to beat the benchmark through superior stock selection. The company also provides buy- and sell-side clients with financial models to value any company in the world and World Class Benchmarking to determine what companies are financially world class. Previously, as Head of Research at CLSA, Andrew was voted No. 1 Analyst in Thailand in the Asiamoney Brokers Polls for 2008 and 2009. He was also voted No. 1 Analyst in Thailand in the 2009 Institutional Investor magazine All-Asia Research Team Report. Andrew earned his PhD in finance at the University of Science and Technology of China in Anhui province, with a focus on answering questions raised by fund managers and analysts during his career about picking stocks and managing portfolios. In addition, Andrew has been a lecturer in finance for 22 years at various universities in Thailand. Since 2013, he has been the president of the CFA Society of Thailand. He is also the author of How to Start Building Your Wealth Investing in the Stock Market.